Patrons’ reactions when walking through the gallery are to simply stare at the giant multimedia exhibits, the flashing colorful lights and the video screens. It takes a minute for them to step into the gallery. In “Suprasensorial: Experiments in Light, Color, and Space,” a new collection at the Hirshhorn Museum and Sculpture Garden, every human sense is tempted in the exhibit where participation is not only welcomed but encouraged. The gallery space features five pieces, crafted by prominent Latin American artists who pioneered the field of experiential design in the 1960s and 1970s. The modern artists challenged the traditional standards of art as a single static experience, breaking down the familiar barrier between the viewer and the art. ‘Neon structure for the IX triennial of Milan’ by Lucio Fontana is a stark room with both the presence and absence of light. “Interest in artists working in light and space has never gone away,” Abby Winograd, research assistant for the exhibit, said. The artists’ goal was the democratization of art, Winogard explained. Scharf led a gallery talk at the museum on Feb. 24 to give art enthusiasts a more in-depth look at the work, explaining the movement’s goal of fostering new experience and challenging perception. “It’s all in our minds – this idea of where and how we experience things. With that being said, when you walk into these experiential art works, it’s important to understand that those relationships can grow and be developed,” Scharf said. The exhibit reevaluates the evolution of the international light and space movement, a now 50 year-old experiment in light and material manipulation. The five pieces are giant multimedia installations that incorporate equal parts of light, color and space. The viewer is not a passive element, simply staring at the art, but is directly involved and expected to respond. Throughout opening weekend, visitors were drawn to Carlos Cruz-Diez’s “Chromosaturation,” a simple construction of drywall, fluorescent lights and colored plastic. Visitors first slip on booties before entering the mysterious white box containing three different colored chambers. The museum provides the booties in hopes of keeping the stark white floors and walls clean. After entering, an intensely pure, almost celestial green light floods the retina to such extreme proportions it takes several moments for the eyes to readjust to a comfortable level. “It’s like instant relief, like very calming to go from green, to red, to blue,” Smithsonian Institution programs and communications assistant Jennifer Leehey said. The work challenges perceptions that color can dictate feeling or emotion – whether blue can equal sadness or if red equates to anger. The work was originally erected in Paris in 1965 with the thought that at the origin of all mankind lays a primary starting point. Cruz-Diez believed that by immersing an individual in such an extremely basic situation, he could generate a whole system of thoughts and emotions. For museumgoers, “Suprasensorial” offers a giant leap into the unknown. But unlike conventional artwork, these intstallations engage each of the senses – not just sight. Venezuelan artist Jesús Rafael Soto’s “Blue Penetrable” is a rectangular expanse created by hundreds of thick rubber strings dangling motionless from the ceiling. Patrons were unsure how to approach it, as they contemplate whether or not to enter, to penetrate the artwork. “People are so used to having that distance and so they still ask whether or not it’s okay to walk through it,” Pandolfi said. “Cosmococa” by Hélio Oiticica, a 1970s Brazilian artist who famously experimented with cocaine to attain higher levels of consciousness, is another thought-provoking addition. Patrons must choose whether or not to participate in the work, to recline on mattresses and listen to high energy Latin music while bearing witness to flashes of disturbing images of cultural icons cut by lines of cocaine projected on the walls. Though each “Suprasensorial” installation taps into different components of the human experience, all challenge the participant to become active in the experience, both in and out of the museum. “Everything in this world is for you. It’s your choice to be able to take it upon yourself, to figure out how to navigate it, or to access that experience,” Scharf said. 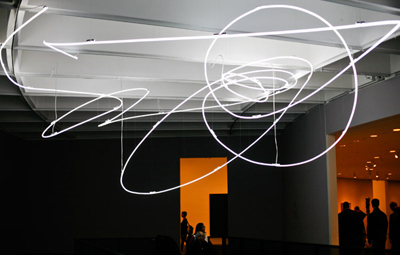 “Suprasensorial: Experiments in Light, Color, and Space” is on display at the Hirshhorn Museum and Sculpture Garden through May 13.